Author Written by Janelle Swanson and last updated on Posted on January 19, 2018 . Posted in Categories All Things SAP. Implementing SAP requires a systematic approach. Companies opting for SAP can use various roadmaps to get SAP implemented in their organization based on the nature and complexity of their business processes and norms, or due to political and environmental factors. Several types of SAP projects have emerged to accommodate these various needs. Big Bang Project – Some companies opt for the “Big Bang” approach where all modules are implemented company-wide in one go. Phased Project – An alternative to the “Big Bang” method where the organization selects some modules for the first phase, then integrates other modules and add-ons in subsequent phases. Roll Out Project – Some companies go for implementing at their head office first, then rolling out to their regional and branch offices later. Upgrade Project – Ongoing maintenance of SAP may require full-scale or mini projects to implement updates to technology and functionality. Expansion Project – Organizational changes and company acquisitions dictate a need for new business units or functionality. Project Preparation involves development of the project plan, identifying the project team members and preparation of resources. Business Blueprint is the phase in which the existing business processes (AS IS) are compared to the SAP processes (TO BE), both are documented and gaps are analyzed. Realization is the build phase in which SAP is configured, testing is performed and the conformity of the system to the blueprint is signed-off. Final Preparation includes the loading and testing of master and historical data in the productive environment in preparation for go-live. Go-Live and Support begins as soon as users begin entering live data in production and requires monitoring by the project team to address training and system issues. Explore SAP’s official website for further insights on the ASAP methodology. 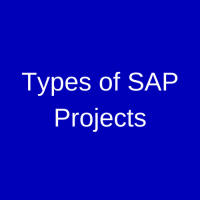 Let’s explore some types of SAP projects in further detail. This type of project aims to go live with all modules across all departments at the same time. The SAP implementation life cycle is followed end-to-end for the full scope of the company’s financial and logistical business processes. This approach may be used for low complexity implementations and smaller organizations to keep costs low, as there is only one implementation lifecycle to execute. However, the necessity for planning is amplified and the risk of missing critical deadlines and milestones is high. A phased project is an alternative to the “Big Bang” approach, wherein a set of modules are identified to be implemented in an initial phase, then further integrations added later. For example, a company may decide to implement financial and analytical modules in the first phase like Finance (FI), Controlling (CO) and Human Capital Management (HCM), then plan a second wave to incorporate logistics modules such as Materials Management (MM), Production Planning (PP) and Sales & Distribution (SD). In a third phase, they may opt to implement add-ons, interfaces or reporting tools. In reality, the phased approach will include several end-to-end implementations — one for each phase. This leads to a longer implementation timeline and therefore higher cost, but much lower risk and steadier performance in the long run. A roll out project is one in which centralized processes are defined and implemented at a central office, then cascaded or deployed at different subsidiaries. For example, a company may begin their SAP rollout at their headquarters. This initial implementation may follow the big bang or phased approach. Once the head office implementation has stabilized based on company-wide business processes and industry best practices, this becomes the standard and a very similar implementation is rolled out to other business entities. In a roll out project, a global template or business blueprint design document is defined by the headquarters and changes are carried out in the form of localization. Every country has its own set of tax, customs and legal regulations known as “statutory requirements”. Every legal entity registered in a company should adhere to the statutory requirements of its respective country. Processes are defined centrally and country-specific changes are carried out during roll out. A roll out project does not include AS IS and TO BE analyses. The TO BE is defined centrally and the roll out team identifies changes which are legal or cultural in nature. Configuration may be done by a centralized team following a standardized process. Modifications are made for statutory requirements through change requests and the rest of implementation lifecycle is followed in a “lift-and-shift” fashion. Like any software, application or operating system, SAP also releases regular updates and new versions. Updates to the existing version are called “Enhancement Packs”. Technical updates may be performed strictly by the technical team during off-peak times. Functional updates may contain additional features or render old features or transactions as obsolete. Thus, a functional update requires a mini-project to implement. Moving to a new version of SAP requires a full upgrade project. A technical upgrade involves incorporating customizations in the new environment. A functional upgrade may be considered a Brown Field implementation, where the previous version of SAP becomes the legacy system. In either case, rigorous testing is required for smooth functioning of the productive environment and seamless release to end users. The company has installed a new manufacturing facility and requires a new plant for logistics planning and allocation. All types of SAP projects leverage at least a portion of the implementation methodology. Various factors dictate the type of project that should be implemented in the organization. We hope this information gives you a good baseline of various project types and how to plan your project for success. I would like to know, how SAP ECC environment is going to work from SAP Cloud platform gateway? SAP ECC and SAP Cloud Platform Gateway are different things. SAP Gateway enables us to expose SAP Business Suite (SAP ECC and S/4HANA) functionalities like BAPIs or any RFC-enabled function modules as REST-based OData services.